Washington pulled off a rare feat with yesterday’s loss to the Cowboys, producing not just one anxiety-inducing postgame story for its fans to spend the week panicking over, but a whole host of headlines to make everyone in D.C. glum and the rest of us joyful. There’s almost too much Skins-related schadenfreude to choose from this morning. Can I interest you in veteran defensive lineman Ricky Jean Francois openly wondering why his coaches failed to make in-game adjustments? How about the whole world screaming at head coach Jay Gruden for calling what felt like 500 fade routes at the goal line? What about multiple offensive players reportedly questioning quarterback Kirk Cousins’s abilities? Wait, there’s more! Take a big bite out of Gruden waiting until the fourth quarter to finally put star cornerback Josh Norman on Dez Bryant. I feel gluttonous! What’s remarkable about all of this isn’t that the Skins are wearing a halo of discord and incompetence—did anyone, deep down, really expect anything less?—but that it’s already shining bright in Week 2. This is a team that won the division last year, and yet somehow it already feels like one that needs wipe the slate clean and start over. 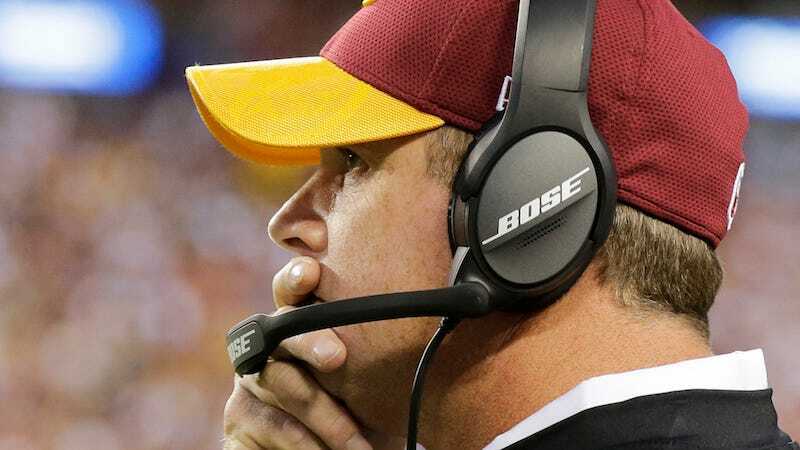 Gruden has had a particularly rough go of it, and his handling of the Josh Norman situation does not inspire confidence in his ability to get things turned around. The decision to not have Norman shadow Dez Bryant during yesterday’s game was reportedly made because Gruden didn’t want to shake the confidence of corner Bashaud Breeland—who got smoked by Antonio Brown last week while Norman helplessly looked on—and didn’t want to throw the rest of the secondary out of sorts. Norman isn’t the only star cornerback to play in a scheme that keeps him stuck on one side of the field—Richard Sherman plays the exact same role in the Seahawks’ scheme—but the difference between the Skins’ defense and Seattle’s is that one is good and one is not. You can afford to deploy a shutdown corner however you want when the rest of the defensive unit is firing on all cylinders, but Gruden is limiting Norman in favor of a scheme that clearly isn’t working. Norman was once again diplomatic when asked about how he was used during the game—“I do what the coaches asked me to do. It’s simple. That’s what soldiers do when they’re in the Army.”—but I am very interested to see what he will have to say after next week’s game against the Giants and his reunion with arch-nemesis Odell Beckham Jr. Then again, there might not be any quotes from Norman next week, because if he has to spend a game watching Beckham pants Breeland, he’ll probably combust on the field.